Moving and mobile storage are like peas and carrots. While each does well in their own right, they just fit together so well that it makes sense to offer them together. As you go about expanding your services to include mobile storage, the following are some of the reasons that it’s the right move for your business to make. Moving requires boxing everything up and stacking it within a truck or container that then has to be moved to the new home. This doesn’t change, but when a customer has the option to use a mobile storage container, they don’t have to drive the truck, deal with the traffic, or worry about when and how they’re going to get to their new home. When clients rent a moving truck or hire a moving company, they are locked into a tight schedule. If they need the truck or the crew for an extra day or two, they have to pay for this. With mobile storage, they don’t have to worry if their schedule needs an extra day, two days, or even longer added to it. The container can be delivered on the date they desire, and that date can be easily changed if they need it to be moved. 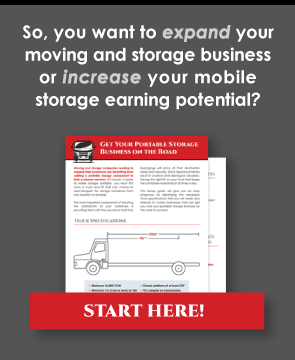 Not every customer is going to want to take advantage of the benefits mobile storage has to offer. Indeed, many clients prefer to have the personalized and individualized attention that an experienced moving crew offers. Retaining your traditional moving services allows you to take care of these clients without sacrificing any of the features or hands-on attention they desire. If you are like most moving companies, you already have a little chunk of land, a moving truck or two, trained personnel, and maybe even a forklift out back. If that is the case, then adding mobile storage won’t require as much of a capital investment to achieve. And, even if you have to buy and build everything to get started, the tools and equipment you will need to purchase can be used to strengthen and support your moving services. Mobile storage is ideal whether it is for a student taking a gap year to study abroad, a soldier waiting for his next deployment orders, or a dedicated worker being temporarily reassigned to a new factory. Mobile storage allows people with fluid schedules and plans to change course and move in a new direction at the drop of a hat. When everything is boxed up and stored in one little package, they can direct it to the place wherever the chips land in their life. The last 20 years have seen a major shift in the American demographic. Most people aren’t as connected to their neighbors and community as they used to be. This means that when it comes time to move, they need to hire a moving contractor with the trucks, equipment, and manpower they need. A moving company that is always ready to go with the right tools, experience, and equipment is a much-welcomed service because consumers don’t have to spend time seeking help and assistance from friends and far-flung family members. There will always be a place for traditional moving services within the marketplace. By adding mobile storage to your offerings, you give client’s an option between the services they are used to and the services they just might fall in love with.